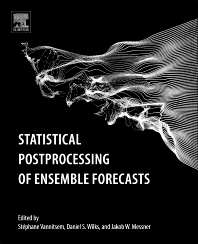 Statistical Postprocessing of Ensemble Forecasts brings together chapters contributed by international subject-matter experts describing the current state of the art in the statistical postprocessing of ensemble forecasts. The book illustrates the use of these methods in several important applications including weather, hydrological and climate forecasts, and renewable energy forecasting. After an introductory section on ensemble forecasts and prediction systems, the second section of the book is devoted to exposition of the methods available for statistical postprocessing of ensemble forecasts: univariate and multivariate ensemble postprocessing are first reviewed by Wilks (Chapters 3), then Schefzik and Möller (Chapter 4), and the more specialized perspective necessary for postprocessing forecasts for extremes is presented by Friederichs, Wahl, and Buschow (Chapter 5). The second section concludes with a discussion of forecast verification methods devised specifically for evaluation of ensemble forecasts (Chapter 6 by Thorarinsdottir and Schuhen). The third section of this book is devoted to applications of ensemble postprocessing. Practical aspects of ensemble postprocessing are first detailed in Chapter 7 (Hamill), including an extended and illustrative case study. Chapters 8 (Hemri), 9 (Pinson and Messner), and 10 (Van Schaeybroeck and Vannitsem) discuss ensemble postprocessing specifically for hydrological applications, postprocessing in support of renewable energy applications, and postprocessing of long-range forecasts from months to decades. Finally, Chapter 11 (Messner) provides a guide to the ensemble-postprocessing software available in the R programming language, which should greatly help readers implement many of the ideas presented in this book. Edited by three experts with strong and complementary expertise in statistical postprocessing of ensemble forecasts, this book assesses the new and rapidly developing field of ensemble forecast postprocessing as an extension of the use of statistical corrections to traditional deterministic forecasts. Statistical Postprocessing of Ensemble Forecasts is an essential resource for researchers, operational practitioners, and students in weather, seasonal, and climate forecasting, as well as users of such forecasts in fields involving renewable energy, conventional energy, hydrology, environmental engineering, and agriculture. Stéphane Vannitsem is a member of the Research Division of the Royal Meteorological Institute of Belgium since 1994, and has been co-editor of three special issues, two in nonlinear processes in Geophysics, and one in International Journal of Bifurcation and Chaos. His fields of expertise include dynamical chaos, predictability and data assimilation, and statistical postprocessing. Jakob W. Messner is a post-doctoral fellow at the Electrical Engineering department of the Technical University of Denmark. He holds a Ph.D. in Atmospheric Sciences from the University of Innsbruck and his main research interests include statistical forecasting for weather and energy applications, ensemble postprocessing, and implementation of statistical methods in open-source software.